INFINITI is the luxury brand of Nissan and was introduced into the American market in 1989 and it was instantly embraced thanks to its sleek and sporty exterior styling and top-of-the-line interior amenities. A partnership with Renault in the early 2000s saw a revival in the brand that resulted in more horsepower under the hood and the addition of a Crossover and Full-Size SUV to the lineup. Currently INFINITI offers coupes, sedans, and SUVs and Barlow Motors in Calgary, AB has an ever-changing inventory of used INFINITI vehicles to choose from. If you have been searching for the unmistakable style and the first-class finishes that only an INFINITI can provide then find out how Barlow Motors can easily and affordably have you driving home in the used INFINITI of your dreams today. Where Can I Find a Used INFINITI Vehicle Near Me? The attraction to used INFINITI vehicles is pretty obvious, their athletic and aggressive exterior style makes it almost irresistible to take your eyes off of them when you see them on the street. 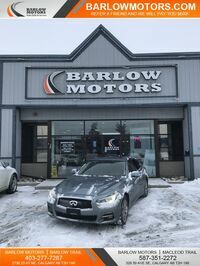 Barlow Motors in Calgary, AB can help you drive home in a used INFINITI that not only matches your style but fits within your budget as well. 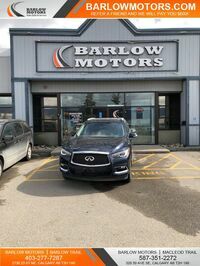 A used INFINITI from Barlow Motors doesn’t only have exterior appeal it also has a comfortable and accommodating cabin that is loaded with the latest technology and safety equipment. Climbing into the cockpit of the used INFINITI that you are after is simple at Barlow Motors website thanks to our easy to use online research and finance tools. It only takes a click of the mouse to sort our inventory by make, model, body type, or even exterior color. After finding the right fit used INFINITI vehicle you can begin the buying process by receiving an online estimate of your trade-in value as well as apply for online credit approval. Our online tools are in place to help customers streamline the car-buying process by eliminating unwanted time spent at the dealership and so you can have the details of the deal worked out before walking through the showroom doors. Interested in a used INFINITI vehicle?